Big Brother Naija 2018 stars, Alex and Tobi have debunked Hotel $ex allegation thrown at them by their fellow ex housemate, Cee-C, at the 3rd episode of the reunion show. We were made aware of this revelation through Alex's manager, Naomi Adenuga. According to Alex’s manager Naomi through a Twitter post, Alex reached out to her that none of what she was accused of happened. 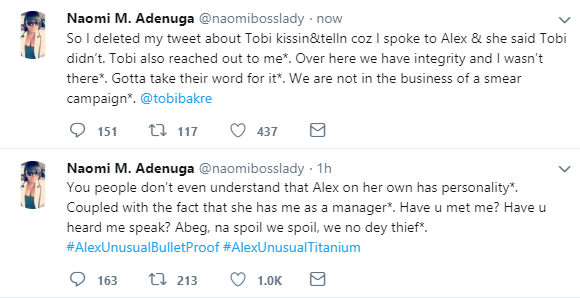 Also, Naomi who had earlier dragged Tobi on Twitter, slamming him for sleeping with Alex and Telling Miracle, said that she had to delete the tweet later on because Tobi reached out to her, and told her that nothing happened, Nina just lied. However non-fans have taken to social media to circulate an old photo of someone believed to be Alex laying naked with someone also assumed to be Tobi on top of her. That leaves us to wonder, 'was Cee-C right'? But nevertheless, even if Cee-c was right, I don't think there is a law prohibiting two adults from having a consensual $exual relationship. Or is there? ARE YOU SEEKING FOR A RICH SUGAR MUMMY/DADDY/LESBIANS/GAY/ IN NIGERIA, GHANA, LONDON, DUBIA, USA, ANYONE INTERESTED SHOULD CONTACT AFRICAN DATING AGENCY ORGANIZATION DATABASE ADMINISTRATOR IN NIGERIA VIA(+2348145236851)the only true legitimate agency for people who are seeking for rich and wealthy sugar mummy/daddy/lesbian/gay/ in Nigeria/Ghana u can also have the opportunity to attend our sugar mummies parties and the executive ladies and men parties by contacting Africa dating agency.